Anchor Music had the privilege of interviewing Our Last Night before their concert at House of Blues Houston. AnchorMusicRob: Welcome back to Houston. I noticed you guys are from New Hampshire. My mom was born in Nashua. What city do you guys originate? OLN: 3 of us were born in Nashua, New Hampsire and the other one was born in Cambridge, Massachussetts. AnchorMusicRob: How has that impacted your music? OLN: There is a woodsy vibe. We have a good local scene with 200 kids at shows. We opened for Chiodos as pre-teens. Bigger bands played there. AnchorMusicRob:How is the tour going? 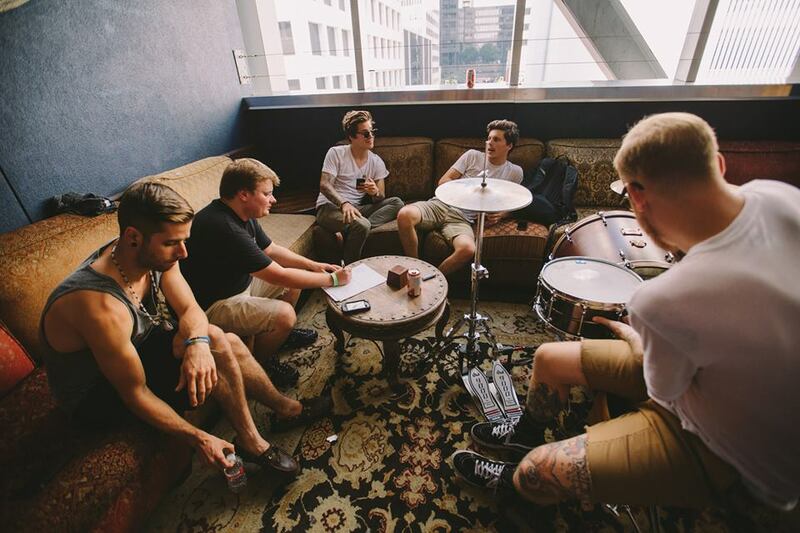 OLN:It is going really good. Over half the shows are sold out. There are way better venues. We are friends with Set It Off. There aren’t in shows in Alabama. AnchorMusicRob: That reminds me of the Montgomery Flea Market guy. OLN: We met him and his eyes are crazy. He is selling studio equipment. AnchorMusicRob:How did you guys get involved with Hope For The Day? OLN: This happened because we know Set It Off’s management. It is a positive thing. Hope For The Day sponsored the tour. Fans are encouraged to write hopeful things on a board. AnchorMusicRob:What is the band’s message? OLN: There isn’t one message. We are positive and want everyone to love each other. We want fans to relate to our songs. Sunrise was inspired by the movie Bull. A line from the movie is in the song. AnchorMusicRob:Boston Red Sox or New England Patriots? Going to a baseball game is fun.We went to a Red Sox game and left after the 8th inning cause their wasn’t anymore alcohol. AnchorMusicRob: Dunkin Donuts or New England Clam Chowder? AnchorMusicRob: Shipley’s and Andrea’s Taco Shop are really good. AnchorMusicRob: Thank you for the time.